← Congrats to Max on his TWO paper publications! What do cheese, zombie ants and the biggest, oldest living thing have in common? Fungi! Mushrooms are the part of the a fungus that we see, but they’re just the tip of the iceberg. Most of the action takes place out of sight. Come learn about the hidden world of fungi in this interactive course. You will learn about the ecology, evolution, and human uses of fungi, and will get hands-on practice identifying mushrooms on your own! A quick guide to Mycologese. 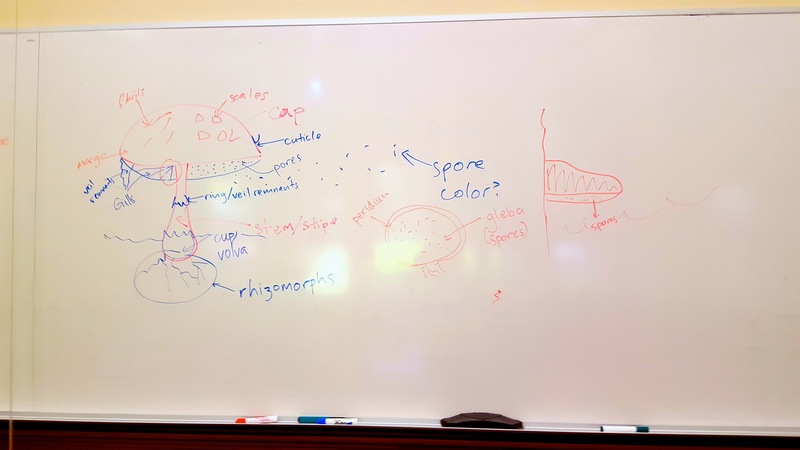 After discussing the diversity and ecology of fungi, Mushroom Maniacs practiced their taxonomic skills by indentifying 12 kinds of mushrooms collected from the Stanford campus and local grocery stores–check out the dichotomous key to the macrofungi of Mushroom Mania! for a full list. Favorites included the delightfully bulbous king oyster mushroom (Pleurotus eryngii), the colorful and phenolic-smelling yellow-stainer (Agaricus xanthodermus), and the very cool caterpillar fungus (Ophiocordyceps sinesis). A Mushroom Mania! student continues a long tradition of mycological art with this charming Pleurotus eryngii illustration. Look at the decurrent gills! Students dissected and keyed mushrooms–the piles of fungal debris attest the power of hands-on learning! 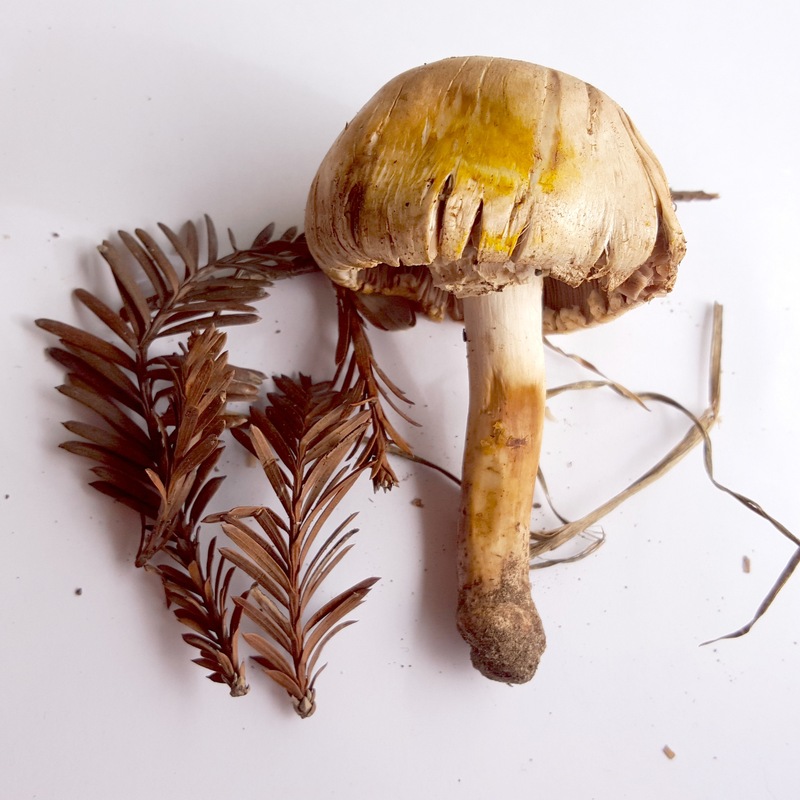 This Agaricus xanthodermus specimen enthusiastically demonstrated “bright yellow staining when bruised” and a “strong phenolic odor.” Mushroom Maniacs learned how to use these characteristics to distinguish it from its familiar grocery store cousin, the button mushroom (Agaricus bisporus). This entry was posted in Uncategorized and tagged education, outreach. Bookmark the permalink.